Though, you'll miss out on all THE FUN! Huh... the sucubuss model has been removed from the site... guess they will release a new one with a supplement or weak 2? Boom, new wracks and haemie. See, that there is a picture. That there is proof, and I am happy to believe again. Despite being worried that their front page is a Haemonculus, which worries me that Covens will be the main focus (do NOT want). Covens are my favorite although yeah, they should focus on Kabals in my opinion. I wouldn't mind that at all. I absolutely love the new Haemonculi. I hope he's plastic, if so he'll be a dream to play with thanks to how great the Dark Eldar entire line of kits is to work with. The new Wracks in plastic - really happy to see them. I heard there are options to make them pilots / gunners for your vehicles - what a great idea. I can't wait to see how the new book is as I think I will be repainting my Dark Eldar somewhat. Two simultaneous threads on the new codex was a bit confusing, so I have closed one in favour of this newer, shorter thread. Ossefactor Hmmm....probably causes explosive bone growth or making flesh into a rigid bone like substance. You know the Wracks have bony growths to use as racks to hang stuff on while they torture victims on another kind of rack. I would imagine there is a device that Haemies use to stimulate the bone growth in a controlled but rapid fashion. They most likely weaponize it by turning up the power just a wee bit. I am developing ther horrible feeling that we're going all Coven-themed, and I'm going to hate it. Correct me if I'm wrong, but the crew of the vehicles in these pictures are all Wracks, and they look somewhat like they're supposed to be. It's rumored to be a 2 week release and the void raven is almost definitely next week. The new wrack box has the parts to crew raiders or venoms with wrecks, so now you can have either warriors, wytches, or wracks. I wouldn't be hoping for any brand new units though. To be fair, the coven IS the area with the most untapped potential in the codex, as well as being exclusively finecast apart from the Talos/Cronos. 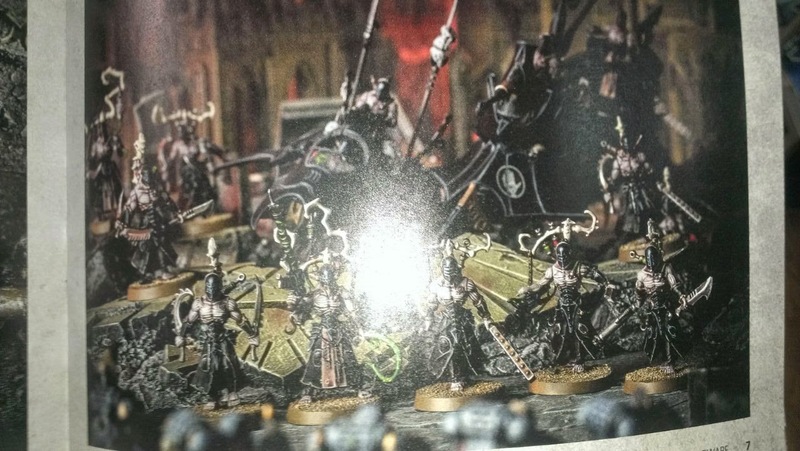 I'd be shocked if the model wave WASN'T heavily coven centric, to be completely honest. I like that we're not seeing a 'big thing' as that doesn't really fit with the Dark Eldar ethos and style, though the Void Raven may well fill that feature. We've got a really, really nice plastic range as it is, there's no need to switch up any of the existing models. I'm probably not going to pick up the new wracks (as my coven models are all extensive conversions) but I will certainly get the codex and see what else appears that piques my interest. 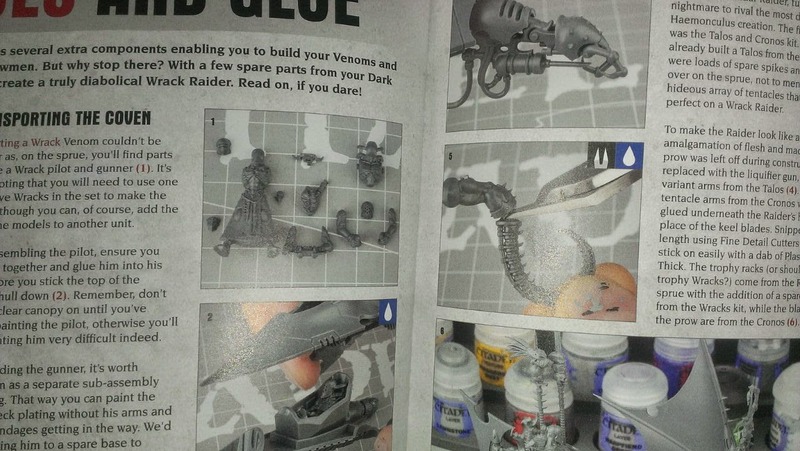 I love the new wracks models, especially the bits for raiders and venoms. Now there is no big problem when building coven specific vehicles - awesome GW! Yeah, I wouldn't be afraid of the Coven Centric Hype! If they have a supplement for the Symphony of Pain, I would love to allie in my coven units, driven by coven pilots. Like others said the Coven is untapped and relatively un-purchased by most New Dark Eldar players. The Finecast costs of grots, wracks, and their HQs scares most people away. I'll be fine as long as Archons can take Wings, Skyboards, and Jetbikes. And if Succubi can take Skyboards or Jetbikes. Please be a thing. Do you know how awesome customizing our Archons would be? Guys... do you realize that the 20 EUR Haemi is the most expensive marine-sized single HQ product? Are they insane? yeah...$26 dollars American. Really hurting my wallet. Looks like I may buy one. Obviously just a rumour at present, but what are your thoughts for powermauls on wracks? Use them for smashing light vehicles?